Lumina Condos at Don Mills and Shepard' is an exciting new condo project that forms the final tower of the very successful Emerald City master planned development. 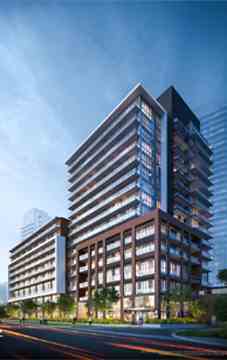 Lumina Condos is a luxury 14-storey low-rise condo development with mid-size units, located in the heart of a high demand North York location. ELAD CANADA'S holdings are primarily located in the key Canadian markets of Toronto and Montreal. Since its inception in 1997, ELAD Canada has focused its business in central Canada, acquiring income producing properties, as well as development sites. The result was that by 2008, the Canadian portfolio was close to 5.9 million square feet of commercial space, as well as nearly 17,000 apartments and seniors’ units. In recent years, ELAD Canada has a new direction, disposing of its income-producing properties to focus on development sites, and specializing in mid- and high-rise condominiums and master planned communities. Residents will enjoy the use of a wealth of shared amenities with The Peak and The Point Condos. These include a theatre room, multipurpose room with common lounge and billiard table for entertaining, landscaped outdoor terrace, a fully equipped fitness centre with a yoga studio and an indoor swimming pool with an adjacent hot tub. Other amenities include concierge service, a family play lounge and a fully-furnished guest suite for overnight visitors. Emerald City is situated at one of the best locations in North York, ON. Steps away from Don Mills Subway, across from Fairview Mall, easy access to 2 major highways (404/401), and close to Seneca College. Lumina condos is the newest tower at Emerald City and the final tower located on Block C.